LG showed off its upcoming Windows Phone 7 Series smartphone this weekend. But despite recent speculation that the handset would debut this coming September - when Windows Phone 7 is itself to be released - LG confirmed that buyers have a longer wait than that. LG described the unnamed handset as an "early prototype" and said that the device's technical specifications have yet to be set. 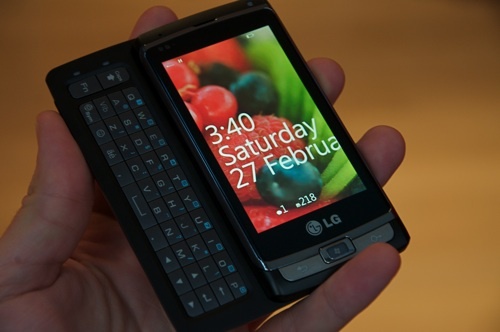 As you can see, though, the gadget presents Windows Phone 7's new, Zune-derived UI and has an HTC-style slide-out Qwerty keyboard. Microsoft unveiled Windows Phone 7 at last month's Mobile World Congress show in Barcelona. The OS is due to debut in September, but phone makers aren't expecting to release handsets based upon it until October at the earliest.